For women, looking good does not call for any occasion, but special occasions like Proms & Weddings do justify exceptional measures, since these are once-in-lifetime events. These special moments would be duly preserved in cameras and handycams & these memories would be referred to time and again. So, what if you are looking tiptop from head to toes on your prom, except for your hairstyle which is totally out of place; this could spell disaster, besides spoiling the mood. Without doubt, a great hairstyle that is in-sync with the look you are trying to carry is as necessary as choosing matching shoes and accessories to go with your outfit. Superbly done hair can get you great compliments, not to speak about the jealous ladies who will be clamoring to get the number of your hair stylist. What can be a better deal than this to make the special occasion more special for you? There are a million things that your hair stylist can do with your hair, but to look stunning there needs to be a perfect blend between certain aspects. For the perfect look, you need to choose a hairstyle that will suit the shape of your face & will complement the outfit you are wearing. 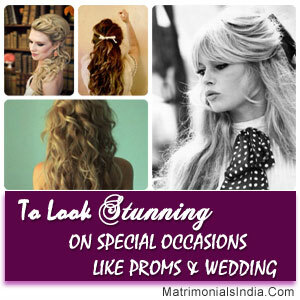 For such special occasions as the weddings and proms, elegant hair-dos are the best choice. Your hair stylist will be able to give you great advice about what suits you best and what hairstyle is currently in vogue. Choose an experienced hair stylist who will create the perfect hair-do to make you look more stunning and beautiful than ever. Hiring an expert hair stylist is essential since they know what hair style will suit you best depending upon what kind of hair you have, whether straight long hair, thick curly ones, wavy hair, short hair, silky hair or any other kind. In the hands of an expert hair stylist, you can rest assured that you will have a superb hair style to add to your looks.